Learning, or rather teaching as a form of education is moving towards greater fluidity and liveliness in the relationship between the academic (author/lecturer) and the student. I’ve drawn on ideas from the Masters in Open & Distance Education (MAODE) that I have been studying with The OU since February 2010. 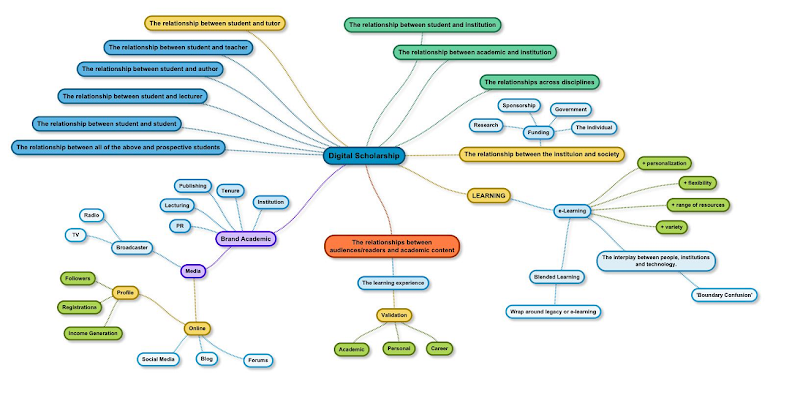 Also ‘The Digital Scholar’ by Martin Weller and ‘Preparing for blended e-learning’ by Chris Pegler. I come to the conclusion that learning, or rather teaching as a form of education is moving towards greater fluidity and liveliness in the relationship between the academic (author/lecturer) and the student. Drawing on a business model, the development of a more organic structure that is less hierarchical, as envisaged by Henry Mintzberg (1994), seems appropriate; it complements what authors such as John Seely Brown say about ‘learning from the periphery’ too. 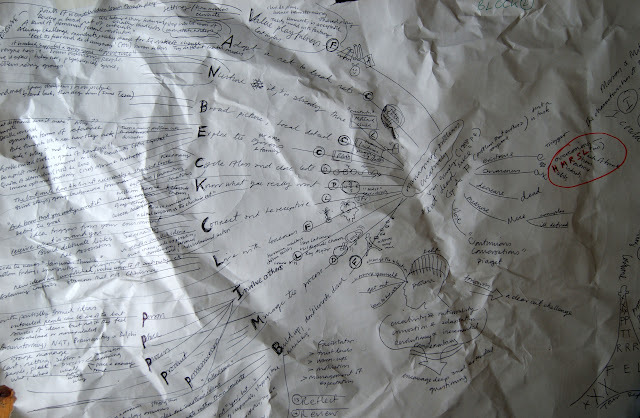 Mintzberg talks of an adhocracy, doodle here when I was making hand-drawn mind-maps during revision for an end of module exam (EMA). One could also draw on a simpler organic structure developed, again in the MBA arena, by Charles Handy. The advantage of a flexible organisation is that it can react quickly to a change in its external environment. Since the 1990s, firms have examined their value chain and tried to reduce their workforce to a multi-skilled core, which is concerned with the creation or delivery of a product or service. All other supporting, non-central functions are outsourced wherever possible to the periphery. Charles Handy suggested, however, that organisations do not consist of just the Core and the Periphery, since the periphery can be subdivided. The third leaf consists of a flexible workforce made up of part-time, temporary and seasonal workers. 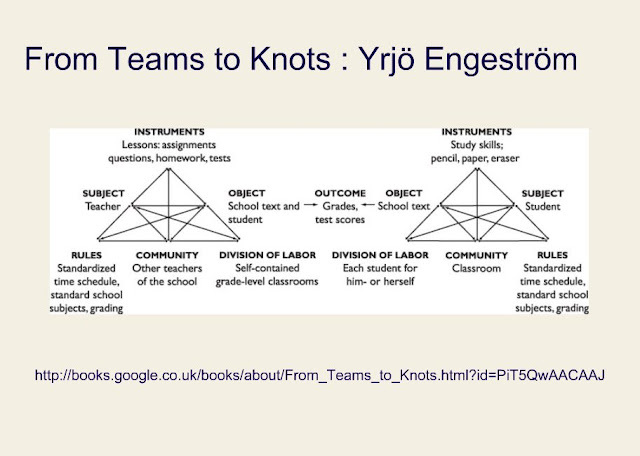 However, the model I constantly turn to is the Activity System of Engestrom (via Vygotsky). 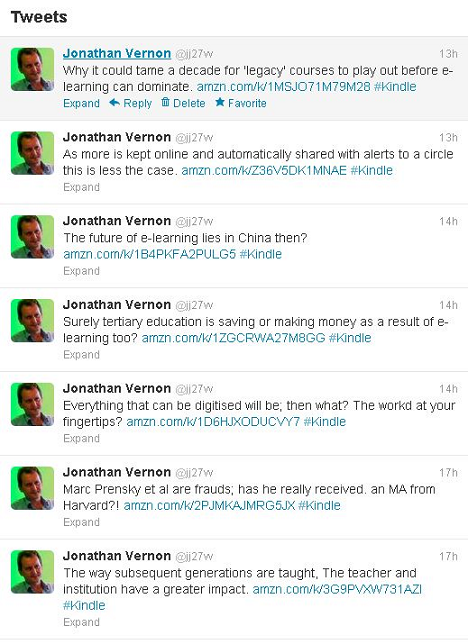 In the spirit of digital scholarship I’ve been experimenting with using Twitter to share thoughts on more than one book as I read them, highlighting a point and adding a Tweet. The feedback has been interesting, as has been the influx of new Twitter followers, invariable all with an academic or commercial interest in e-learning. So come and join the feed, though from time to time you will receive tips on swim teaching best practice (how to fix a screw kick in breaststroke and some such) or as likely thoughts on life in the trenches as a machine gunner as we approach the centenary of the First World War. I’d like to see this offered as an APP or Tool so that digital assets (stuff) or ‘E-tivities’ (Salmon, 2002) are automatically aggregated as a fluid, initial offer. In other words, assets are seen as a way of catalysing a process of exploration. Vygotsky, L.S. (1978) Mind in Society: The Development of Higher Psychological Processes, Cambridge, MA, Harvard University Press. Waterman, R. H. (1990). Adhocracy: The power to change. The Larger agenda series. Knoxville, Tenn: Whittle Direct Books. I had a dream like is when I was 10 or 11 in Beamish Dormitory at Boarding Prep School. I was set upon by two musketeers and killed. I returned to the same dream the next night behind them and ‘got them’ first. I guess I had learnt how to cope with some set of shifting boy, gang, friendships. I’m not at home and was woken two often last night: doors banging, couple chatting above my head, dog barking and a fax machine going off. This woke me in the middle of a recurring dream that related to a database of over 100 videos I am reviewing. Currently I have a database, in columns and rows in Word. It is hard to read. I need a simple way to see, share and add to this. My dreams gave me ‘Top Trumps’. A quick Google shows why this works: a screen grab, some basic facts on a single sheet (or card). I could even order a bespoke pack. Re-reading the Steve Jobs biography with four months in hand before another MAODE module I am struck by what it tells you about Gates and Jobs and how self-evidently one is an adaptor ‘doing things better’ while the other is an innovator ‘doing things differently’. This drawn from doing a KAI personality innoventory and all the reading around these tests for B822. I came out at 144 on a scale of 160; I’d envisage Jobs as somwhere on the outer edges of 150 while Gates gets a 20 or 30, neither would be in the 60-130 zone for two thirds of respondents. If they ever did one ofthese are the results known? As most managers do observation and experience of a person’s behaviour and responses must suffice. I feel a desire to revisit H807 ‘Innovations in E-learning’ while mixing it up with B822 ‘Creativity, Innovation and Change’. I can do this through the 1000+ entries I have here and by refreshing my mind from the current and archived blogs of others blogging here currently (though few if any blog there way through the MBA programme and I am yet to find anyone blogging about B822). Are you in the flow? What about your team? Where do they stand? April 27, 2012 8:50 am / 1 Comment on Are you in the flow? What about your team? Where do they stand? The value of being taught in a classroom or workshop is that the tutor can draw on their knowledge to suit the moment. This is one of the most memorable images I will take from the OU MBA module ‘Creativity Innovation & Change’ because married with other things I came to understand about myself it represents when things go well and when they do not, what it takes for me to be in the ‘flow’ is a narrow band of frenetic activity, the night before a live show, the morning of a live broadcast on location, swimmers in the warm up at a big competition … as well as quiet though equally engaged periods with a drawing or piece of fiction. As a manager you want everyone in the flow do you not? A team of types who complete a variety of tasks required to see a project through to its successful conclusion. Complementing this is Kirton’s Adaptor Innovator Scores, knowing if someone’s preferred operating style is to ‘do things better’ or ‘to do things differently’. Not only did I write one of these in my OU MBA Module exam (B822 Creativity, Innovation & Change), I even drew it as the essay plan for one question. Large and bold with space to annotate my six ideas into each petal and to scribble down some thoughts on the introduction and conclusion (up and down the stem). I doodled mnemonics on the themes around the petals. I gave myself 5 minutes per theme and 10 minutes to get into and out of the topic. I suppose I wrote 200 to 350 words per theme. They may not look very pretty but anagrams, sayings and mnemonics all have their place. However, you have to fix them in your head, which includes all of the senses. I had to visualise a couple of my mnemonic lists (VAN BECK CLIMB)as a short walk through our house seeing hockey sticks and flippers in the porch at the front door (playfulness), a woman sitting on the stairs with a broken tennis racket (adopt a set to break sets), at the top of the landing another woman cuddling an infant (it was always there, nurture it), then a massive Damien Hirst butterfly picture on the wall (broad picture, local detail) and so on ... people in a room, riding a bicycle (oh yes! ), then for key components of a 'messy' problem '[I could use a colourful swimming costume: ICUACSC) a photograph of James Mason perched on the end of springboard with a Russian looking girl called Olga Mitroff. In both cases I used this in the exam, quoting 'Mason and Mitroff' and drawing in what I saw as I walked through the house. I ended up with 5 mnemonics per block, some only three letters, as in VATCC and CAPO. That's 15 which a week on I still know as: POVCC, MHIVE, and MDMAP ...if you can see it these are 'point of view', 'Maldhives' and 'Mindmap'. These 15 key letters gave me the longer mnemonics and phrases. All of this I practiced and on the day filled a 'rough book' in 10 minutes. When it came to looking at the questions, with one exception, the fit was immediate. With the third I had to cherry pick from what I had laid out. It took time to embed these pegs in my cerebellum, but if you want to sit down to an exam, turn the question page and develop a knowing Mona Lisa smile this is the way to do it.